This Tony Award and Pulitzer Prize-winning rock musical is a heartbreaking, humorous and unflinchingly authentic look at a suburban family struggling with the effects of bipolar disorder. Set to a pulsating rock score by Tom Kitt, with a powerhouse female lead at its core, Next to Normal will leave you breathless. 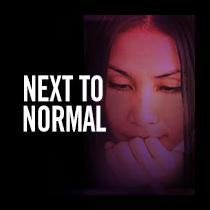 The Los Angeles Times raved about this production, saying "At East West Players, the gut-wrenching emotion of Next to Normal transcends race... Go, and don't forget the tissues." Broadway World wrote, "A stunning Next to Normal wows!" After the performance, we will be joined by actress Kerry O’Malley in a discussion of the show. Kerry, who received her training at Harvard’s American Repertory Theater Institute, has appeared on TV, in the movies, and on Broadway — including starring in “Into the Woods”, which also played the Ahmanson.